The household is a place where change can happen, a place where change needs to happen. Sally Geislar is the Founding Director of the Food Works Lab at the University of California Irvine. She is a Doctoral Candidate in Planning, Policy, and Design in the School of Social Ecology. 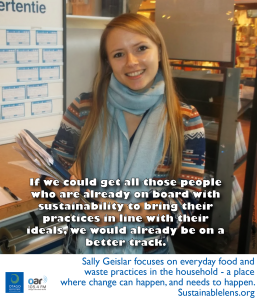 Sally currently manages three funded projects on local food and food waste systems. Her primary research examines the role of household behaviour in successful kerbside organics collection programmes. I’m really interested in people, and how people have created the world we live in, but how at the same time it seems like it has always been this way. The world is just the result of millions and millions of decisions, and realising that if there’s something messed up about it, we can make different decisions. Daunting on one hand because there there were some many decisions, with momentum behind them, but at the same time hopeful because we’re humans making decisions and we can start to make different ones. So my work is on those everyday behaviours…households. If we could get all those people who are already on board with sustainability to bring their practices in line with their ideals, we would already be on a better track. I’m interested in consumption, broadly speaking, and I’ve found waste to be a really interesting lens on that to understand the values of a culture. Farmers markets…put us face to face with the humans who are producing our food. Food waste, at 22%, is the largest component of all the materials going to landfill. Organic materials – food waste and yard waste – generate a quarter of the country’s methane emissions. But we can’t just make a system and expect that everyone is going to fall right into place….there’s a human element to the technological solution. How does kerbside collection affect households? Do people change their practices within the home? For some people it will be “just build it and they will separate”, for others it will be a totally foreign thing. But it is the same garbage you were making before, it is just in a different bin. The household as a unit of analysis. The household as a place where change can happen, a place where change needs to happen. Little things…but don’t give up on the other things. Culture has to change, along with the built environment. Study…to what extent does culture shift, just by having changes in the built environment. Norms change…in the 70s you could smoke on a aeroplane…now its unthinkable…if we play our cards right we might see that same sort of shift with foodwaste…the idea of wasting food by throwing it in a landfill will be unthinkable. The kerbside bins are a powerful communication of norms, of change in behaviour in the home. Sustainability…we live in a very complex world. The (Brundtland definition)…how will we know what needs they’re going to have in an unimaginable future. For me it is about needs and systems being cyclical. A lot of our systems are linear and end in the landfill. The more systems that we can bring back into the cycle , so that those materials that are waste from one system are raw materials for another…the closer we’ll be to sustainability – but it’s really not a destination, it’s a process. (Success) Clear vision of how I can combine my passion and my career. Growing up, the opportunity explore and to have un-manufactured experiences. (Activist) An important question, one which environmental scholars are confronted with regularly. Our work does take a normative stance, of how the world should be, or at least how it shouldn’t be. To the extent that I am trying to change the way that policies are implemented, and developed, and change the hearts and minds of the people that are parts of those systems who are influenced by those policies, way that they react to those policies, engage with the goals of those policies, then in some ways I am an activist, but I think I’m a scholar first. There’s a certain level of data, rigour and truth-seeking that isn’t necessarily absent in the activist’s world but is at the heart of the scholar world. And that’s where I start from, with the goal of making the world a better place in that way – I think I may be considered an activist scholar, or a scholar activist may be more appropriate. (Motivation) I really love what I’m doing, and other people getting excited about the issues that I’m excited about. Seeing other people get interested in the possibility for change on these larger scales through the work that they are doing – that’s incredibly empowering and motivating. Continuing applied research with an interdisciplinary scope…bringing other people and organisations into that. (Miracle) At the heart of it, I would wave a magic wand and people would see themselves as part of natural systems instead of apart from natural systems – and that awareness would change the way the prioritise things in their lives. If we could see more of that, we would see a lot more of the other things that we would like to see. (Advice) Don’t be afraid to try new things, and if it doesn’t work out as you planned, look to people for whom it has worked and see if they are doing something differently. This Sustainable Lens is from a series of conversations at University California Irvine. Sam’s visit was supported by the Newkirk Center for Science and Society, and coincided with Limits 2015.